Las Vegas, NV, USA: Super Welter: Tony Harrison (27-2) W PTS 10 Ishe Smith (29-10). Welter: Erick Bone (20-5) W PTS 10 Cameron Krael (13-13-3). Cruiser: Andrew Tabiti (16-0) W KO 6 Lateef Kayode (21-3,2ND). Light Heavy: Lanell Bellows (17-2-2,1ND) DREW 8 Naim Terbunja (10-2-1). Light: Ladarius Miller (16-1) W PTS 8 Jose Marruto (10-8-2). Harrison keeps on track for another world title shot as he wins majority decision over Smith although Harrison looked to have done enough to have won clearly. Both fighters boxed cautiously over the first two rounds. In the third a right cross, a punch that gave Smith problems throughout the fight, caused Smith to dip at the knees and it was counted as a knockdown although it was questionable whether Smith’s knees actually touched the canvas, Smith recovered well but Harrison carried the impetus from that success into the fourth which he took with some jolting combinations. Smith had a better fifth as he rattled Harrison with a left only for Harrison to bang back and rock Smith in the sixth and it looked as though he might stop Smith but the veteran survived. The seventh saw Smith outwork Harrison only for Harrison to again swing things his way by scoring heavily in the eighth. Smith was the busier fighter in the ninth but in the last the younger fighter had more left and he took that round and the decision. Scores 97-92 and 96-93 for Harrison and 95-95. An important win for Harrison as he works his way back into contention looking for another title shot after a crushing loss to Jarrett Hurd for the Vacant IBF title in February last year. His only current ratings places are WBC 10 and IBF 11(9) so he has a way to go yet. For 39-year-old former IBF champion “Sugar Shay” Smith time is running out. He was always in the fight here but he is now 4-5 in his last 9 fights with all 5 losses being in important fights. Bone gets split decision over Krael after ten entertaining rounds. Bone was off the mark quicker and scoring with eye-catching combinations to build a lead over the first three rounds. The fight caught alight and provided plenty of furious exchanges. Krael looked to be taking over the fight in the fourth and fifth but he only just survived a rocky sixth being in deep trouble at the bell. He steadied the ship with a good seventh and over the later rounds he seemed to have more in the tank and pressed hard eating into Bone’s lead connecting with some heavy punches. It proved a case of close but not quite as the decision went to Bone. Scores 96-94 and 95-94 for Bone and 95-94 for Krael. A run of four losses to Shawn Porter, Chris Algieri, Miguel Vazquez and Eddie Ramirez saw Bone return home to Ecuador where he scored three wins over very ordinary opposition before return to the US for this fight. After a run of five losses Krael was 5-0-1 in his last six fights. Tabiti wins an ugly fight with kayo of Kayode. The styles did not mesh well and there was too much clinching and wrestling as Tabiti wanted to keep working at a distance and Kayode wanted to get inside, Tabiti looked to have the edge but the finish was sudden. Tabiti had backed Kayode to the ropes and as they worked inside he clobbered Kayode with a booming uppercut that dropped Kayode to his knees and he was counted out. Tabiti, the 28-year-old Chicago “Beast” makes it 13 wins by KO/TKO. With wins over the 17-0 Keith Tapia and former champion Steve Cunningham he is stealthily creeping in under the radar and is already the WBC No 4. He missed out on the big prizes as an amateur getting a silver at the US Championships and a bronze at the National Golden Gloves. Losses to Mike Hunter and Joseph Williams at the US Olympic Trials ended his hopes of an appearance at the London Olympics. US-based Nigerian Kayode, 35, drew with Antonio Tarver and was stopped inside a round by Luis Ortiz with both verdict changed to No Decision when Tarver and Ortiz tested positive for a banned substance. He was stopped in eight rounds by Denis Lebedev for the WBA title in 2015 and his chance has passed him by. Unfortunate ending to a good even match. It was close all the way with Terbunja just having a slight edge. In the fifth a clash of heads saw Bellows cut. The cut worsened over the sixth and seven due to punches and after one minute of the eighth and last round the fight was halted as the cut was too severe for Bellows to continue. The scorecards at the stoppage read 76-76 twice and 77-75 for Terbunja so a technical majority draw.Disappointing outcome for 34-year-old Kosovon-born Swede Terbunja as he was re-launching his career after 17 months of inactivity. He was an outstanding amateur being a seven-time Swedish champion who won a gold at the US National Golden Gloves beating J’Leon Love and Luis Arias in the tournament. Bellows 32 fighting in his home city was 11-1,1ND in his previous 12 fights. Southpaw Miller continues to progress with a unanimous decision over Mexican Marruto. Scores 79-71, 78-72 and 77-74 for Miller. Miller made a good start taking the first and then flooring Marruto in the second. From there Marruto showed he was not about to crumble and although a clear winner Miller had a fight on his hands to the final bell. Scores 79-71, 78-72 and 77-74 for Miller. The 24-year-old from Memphis has won his last seven fights including victories over Jamal Herring and Carlos Padilla. Phoenix-based Marruto has lost his last three fights. Philadelphia, PA, USA: Light: Devin Haney (19-0) W RTD 9 Mason Menard (33-3). Super Bantam: Joshua Greer (17-1-1) W TKO 8 Glenn Dezurn (9-2-1). Super Bantam: Adam Lopez (16-2-2) W Arnold Khegai (11-0-1). Light Heavy: Charles Foster (16-0) W PTS 8 Alvin Varmall (15-1-1,1ND). Haney outclasses experienced Menard. The talented young Haney was just too fast of hand and foot for Menard. From the outset Haney was slotting home jabs and firing quick combinations. Menard tried to cut off the ring to work inside but the lateral movement of Haney and that sharp penetrating jab were just too much for Menard to deal with. Haney slowly wound up his attacks adding more combinations into the exchanges. Menard tried to walk through the punches to get a foothold in the fight but he never came close. As Haney added more power to the mix Menard was having to take some heavy punishment and although he was not in deep trouble he never looked likely to land the big punch he needed and his corner made a sensible decision and pulled him out of the fight at the end of the ninth round. “ The Dream” from San Francisco is still only 19. He turned pro at 16 and because of his age he had to go down to Mexico to fight until he was given dispensation to fight in the US. At the age of 17 in his first fight in the US he appeared on the undercard of Manny Pacquiao vs. Tim Bradley III at the MGM. He is trained by former world champion Mike McCallum and must be considered one of the best prospects in boxing right now. Menard, 29, had a breakthrough year in 2016 when he knocked out both 21-0 Eudy Bernardo and 19-2 Bahodir Mamadjonov but the year ended badly when he was knocked out in seven rounds by Ray Beltran in December with Beltran going on to win the WBO title three fights later. Greer punches too hard for Dezurn. After a close first round Greer rocked Dezurn late in the second with a right. Dezurn recovered from that and from another right in the third. He fought back to just edge the fourth only to be shaken again in the fifth. Dezurn continued to be competitive and rebounded with a strong seventh to keep himself in the fight. It proved a vain effort for in the eighth a big right from Greer literally stopped Dezurn in his tracks and sent him face down on the canvas. Somehow he made it to his feet and convinced the referee he was able to continue but the follow-up attack from Greer had him in trouble and the referee stopped the fight. Chicago’s Greer continues his impressive run. He has now won 14 in a row and ended six of his last seven fights by KO/TKO. Dezurn falls to 0-2-1 in his last three fights. Ukrainian Khegai wins in his first fight in the US as he takes unanimous verdict over the more experienced Lopez. The opening round looked about even but Khegai stunned Lopez with a perfectly timed counter late in the second. Lopez was taking the fight to Khegai but after that early success with a counter the Ukrainian had found a winning strategy and it was his counter punching that gave him the edge. Things got a little rough inside in some rounds and Khegai lost a point in the sixth for a punch to the back of the head. Khegai tired a bit over the sixth and seventh but produced another hard accurate right in the last to put the seal on his victory. Scores 77-74 twice and 78-73 for Khegai. He moves to seven wins in a row. He had about 30 Muay Thai fights and won versions of the World and European titles before moving over the boxing. This is his first fight outside Russia. Texan Lopez, 27, won his first 15 fights but is now 1-3-2 in his last six but the other two losses were to the now WBA super bantam champion Daniel Roman and to Jorge Diaz. Foster comes out on top in the contest between two unbeaten boxers. Foster had the better skill set with Varmall being the aggressor, pressing hard but not always being tidy or accurate in his work. With his longer reach Foster managed to box on the outside but Varmall, the harder puncher, kept it close. From the fifth Foster had worked out what he needed to do and from there he bossed the fight. He outboxed and outworked Varmall and constantly caught Varmall with counters. Varmall tried desperately to find a winning punch in the last but left himself open and Foster eased his way to victory. Scores 79-73, 78-74 and 77-75 for Foster. Two useful wins in a row for the 27-year-old from New Haven who was coming off a victory over 19-3 Justin Thomas in February. "Iron Majik” Varmall from Louisiana had won 5 of his last 7 fights inside two rounds but was well beaten here. Philadelphia, PA, USA: Super Light: Mykal Fox (18-0) W PTS 8 Anthony Mercado (11-4). “The Professor” adds another wins as Fox scores unanimous decision over Puerto Rican Mercado. Scores 79-73 twice and 78-74. The 6’3 ½” (192cm) Fox is going to be a difficult opponent for any super light and at 22 could yet finish up a couple of divisions higher. If there is a weakness it is in his lack of punch power with just four wins by KO/TKO. Mercado, 23, at 5’11” (180cm) is also tall for the weight. This is his third loss in his last four fights. Arriaza gets the win but without the expected fireworks. Last time out the Californian-based Nicaraguan had blown away useful Sammy Valentine in just 20 seconds but Ruiz was a cagier proposition and Arriaza had to box his way to victory. The first half of the fight saw Arriaza stalking but not being able to pin down Ruiz. There were some exchanges but neither fighter landed anything of consequence. Arriaza stepped on the gas in the seventh but Ruiz managed to stay out of trouble and rebounded to have a useful ninth. Arriaza already had the fight won but he finished with a dominant tenth and was a clear winner. Scores 99-91, 98-92 and 97-93 all for Arriaza. A win for Arriaza but his run of three first round finishes on the bounce and nine overall led the crowd to hope for more. Two losses in a row for Venezuelan Ruiz having been stopped in seven rounds by unbeaten Alex Besputin in November. Ituarte extends his winning run with unanimous decision over former WBC title challenger Carson in an exciting contest. Both were looking to dominate and willing to trade punches to try to impose themselves on the fight. The rounds were close with both having good periods but Ituarte built a lead by just getting the better of some furious exchanges from the fourth to the seventh but there was not much in it as they battled to the bell in the eighth. Scores 77-75 twice and 78-74 all for “All American Boy” Ituarte. The 23-year-old from Gomez Palacio, Mexico grew up and is now based in Santa Ana. He is No 12 with the WBO. He has wins over some reasonable level opposition but Carson is his biggest scalp so far. Carlson . a 27-year-old from Tijuana, had put together a run of 22 wins until losing to Shinsuke Yamanaka in seven rounds for the WBC bantam title in March last year but lost an eight round fight to Isaac Zarate in his last fight in July. Texan Dutchover uses a focused body attack to halt Fowler. Body punches accounted for two knockdowns scored by Dutchover with the second one ending the fight in the third round. The 20-year-old Dutchover makes it six wins by KO/TKO. He won a number of Regional title and turner pro in 2016 after finishing as runner-up in the 2016 National Golden Gloves . Now six losses by KO/TKO for Fowler. A bad night all round for Reynoso as he is floored twice and deducted a point in losing a technical decision and his interim WBC Latino title. Southpaw Papeschi took control early flooring Reynoso with a straight left in the second and later flooring him with a right in the sixth. Reynoso got into the fight by taking the seventh but his was a lost cause after he was docked a point in the eighth for holding. Reynoso was doing some good work in the ninth but Papeschi had been cut over his left eye earlier and survived four inspections by the ringside physician but in the ninth it was ruled that the cut was too bad for the fight to continue and it went to the cards with Papeschi winning on scores of 86-82 twice and 87-82. The 26-year-old Papeschi, the Argentinian No 4, lost to Reynoso in December when he was disqualified for head butts. Reynoso, the Argentinian No 2 had won 5 of his last 6 fights. Velasco, a favourite of the local fans gets early win. Velasco landed some jarring punches in the first. Southpaw Garcia came out aggressively in the second taking the fight to Velasco, The local fighter used good footwork to avoid the rushes and then landed two body punches followed by a short left hook to the head that floored Garcia. He made it to his feet but the referee ruled he was in no condition to continue and stopped the fight. The 31-year-old “Pitbull”, the Argentinian No 4 moves to twelve wins by KO/TKO. Garcia had won his last three but this is his fifth loss by KO/TKO. Szello has no trouble getting rid of Venezuelan Ocando. "Imo” put Ocando down late in the first with the bell saving Ocando. Szello ended it with another knockdown in the second and the referee stopped the fight. The 34-year-old former top amateur is rated WBO 4/IBF 10(8) making the highest ranked Hungarian fighter but he is nowhere near landing a title bout at this time. Fifth loss by KO/TKO for Ocando. Southpaw Egedi keeps his good form going as he wins every round against Georgian Gujejiani. Egedi dominated the fight with Gujejiani handicapped by a cut over his left eye and never being in the fight. Scores 80-72 from all three judges. The 23-year-old Hungarian champion is 10-0-2 in his last 12 fights. Gujejiani drops to 4 losses in his last 5 fights. Rome, Italy: Middle: Mirko Geografo (11-1-1) W TKO 6 Domenico Spada (43-7). Malaga. Spain: Super Middle: Ronny Landaeta (15-0) W KO 7 Bruno Tavares (12-2-1). Light: Samuel Molina (7-0) W PTS 8 Giuseppe Carafa (9-2-1). Middle: Catalin Paraschiveanu (17-1) W PTS 6 Mamadou Goita (5-8-1). Spanish champion Landaeta remains unbeaten and holds on to the IBF International title with kayo of Tavares. Over the early rounds Tavares was able to use his longer reach to make life difficult for Landaeta. By the fourth round Landaeta was cut and having difficulty pinning Tavares down. Landaeta stepped up the pace and Tavares started to tire, In the seventh Landaeta took Tavares to the ropes and landed a heavy right that put Tavares down and out and it was a few minutes before Tavares recovered. The 35-year-old Venezuelan-born Landaeta, a former MMA competitor, has 10 wins by KO/TKO. He will contest the vacant EU title with Italian Valerio Rinaldi on 7 July in Malaga. Tavares, 27, a Swiss-based Portuguese showed some good skills. He had won his last two fights but now has a second loss by KO/TKO. Oviedo, Spain: Welter: Aitor Nieto (22-5-1) W TKO 2 Jony Vina (7-4). Welter: Jose Del Rio (28-7) W PTS 8 Igor Faniyan (15-15-3). Super Welter: Sergio Garcia (27-0) W PTS 8 Giorgi Kerdikoshvili (10-19-5). Fighting in his home town Nieto wins the vacant Spanish title with stoppage of overmatched Vina. Nieto had too much power for Vina and scored two knockdowns. Although Vina beat the count on the second knockdown Nieto hammed home head punches that had Vina reeling and the referee stopped the fight just as the towel came in from Vina’s corner. The tall 24-year-old Nieto has lost in two shots at the European Union title both against tough opposition but is now looking to set up a domestic clash against Ceferino Rodriguez which will be a big attraction. Second loss by KO/TKO for Vina. This was supposed to be an easy night for Del Rio but in the end the EBU No 11 was given eight tough rounds by Faniyan before getting the unanimous decision. The 32-year-old from Palma, a former Spanish welterweight champion, had an eight bout winning streak snapped when he lost his national title to Kevin Lejarraga in November. This is his second win this year. Armenian Faniyan has now lost six fights in a row with the fights taking place in five different countries. “El Nino” Garcia gets eight rounds of work as he prepares for a challenge for the European title. It was one-way traffic as the tall Garcia was able to use his height and reach to force Georgian Kerdikoshvili on to the back foot. Garcia landed right crosses throughout the fight and Kerdikoshvili soaked up a lot of punishment and did well to last the distance without ever coming near to even sharing a round. The 25-year-old Garcia will have to travel to France to challenge the European champion Zakaria Attou but will be looking to join Kevin Lejarraga, Mark Vidal and Abigail Medina as European champion giving Spain its fourth champion. Kerdikoshvili, who turned pro at 16, has managed to win one fight outside Georgia-but only one. Pathum Thaani, Thailand: Bantam: Saenganan (20-1) W PTS 12 Vikash Dahiya (5-1).Super Fly: Petchbarngborn (43-8-1) W PTS 6 Nirun Baonok (5-14). Teenager Saenganan (Thiranan Matsali) gets back into the winning column with unanimous decision over Indian novice Dahiya. Saenganan’s greater experience saw him win this one as after some close early rounds the Thai was stronger over the second half of the fight and he emerged the clear winner. Scores 116-112 twice and 117-111 for Saenganan. The 18-year-old, who turned pro at 13, won his first 19 fights before losing in an upset to journeyman Edison Berwela in January. This victory gets him the vacant WBC Asian Boxing Council title. Dahiya, 25, was having his first fight outside India, was jumping from eighth rounds to twelve and also facing a much higher level of opposition than he has met previously so did well here. Petchbarngborn (Karoon Jarupianlerd) gets in some paid sparring as he outpoints poor fellow-Thai Baonok. Petchbarngborn took things easy over the first three rounds but then floored Baonok in the fourth and punishment him mightily in the fifth but Baonok survived and went the distance. After a 4-5-1 start to his career Petchbarngborn improved and he has won 21 of his last 22 fights with the loss being a tenth round kayo defeat against Naoya Inoue for the WBO super fly title in 2016. Nothing to say about Baonok who filled the other corner-someone had to. New York, NY, USA: Light: Vasyl Lomachenko (11-1) W TKO 10 Jorge Linares (44-4). Welter: Carlos Adames (14-0) W PTS 10 Alejandro Barrera (29-5). Light: Teo Lopez (9-0) W KO 1 Vitor Freitas (14-2,1ND). Feather: Michael Conlan (7-0) W PTS 8 Ibon Larringa (10-2). Super Light: Fazliddin Gaibnazarov (4-0) W TKO 4 Jesus Silveira (8-6-2). Light: Jamal Herring (17-2) W TKO 5 Juan Pablo Sanchez (30-16,1ND). In a fight of the highest quality between two master boxers Lomachenko climbs off the canvas to end the fight with a body punch and become a three-division champion after only twelve fights. Tactical start by both men Lomachenko working his right jab and mostly taking the fight to Linares with the Venezuelan using his longer reach to score with his jab and having a very slight edge. A great exhibition of skill from Lomachenko in this one. He took the fight to Linares and was getting past the jab scoring with long lefts to the body and quick hooks moving around changing angles. Apart from a sharp left hook late in the round Linares was totally outboxed. Another brilliant round from Lomachenko. Linares did a bit better but Lomachenko was setting a fast pace outworking Linares firing quick bunches of hooks and digging to the body. Again he kept changing the angle of his attacks and his hand speed was just too quick for Linares. Lomachenko continued where he left off in the fourth. His movement, hand speed and accuracy were creating gaps in the defence of Linares. The champion was firing back more and landed some good counters but just before the bell was left befuddled and wildered by a flashing combination from Lomachenko. There was quality punches from both fighters in the sixth. Once again Lomachenko’s work rate was higher and he scored with some hard lefts to the body. Linares fired off a rapid combination and landed with hard lefts to the body. Lomachenko was on his way to winning the round when with just 30 seconds left Linares drilled him with a straight right that sent the Ukrainian down on his rump. He was up immediately and did not look badly shaken and he stayed out of trouble to the bell. With his confidence boosted by the knockdown Linares went on the offensive in this one. He worked the jab well and scored with a couple of flashing combinations. Lomachenko stayed busy but the better punches came from Linares. Lomachenko was back on top in the eighth. His speed and movement kept Linares off balance and although he was not loading up with his punches Lomachenko was getting past the jab and landing right jabs and hooks. Linares was constantly looking to get home with that straight right again but had no success although he scored well with his jab and some left hooks to the body. This time it was Linares putting on a master class. He was on the front foot for most of the round banging home his jab, switching to body and drawing Lomachenko onto counters. He landed a couple of classy combinations and although Lomachenko worked hard the round belonged to Linares. Linares had taken three of the last four rounds and things seemed to be turning his way and he came out firing in the tenth and then Lomachenko got into the groove and they stood and exchanged high quality shots. 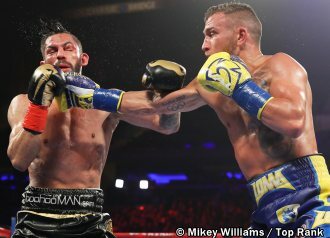 Lomachenko seemed to have Linares hurt and although Linares banged back Lomachenko stood in close and landed left hook to the head , a left uppercut followed by a series of short hooks and then a vicious rib bending left hook to the body that sent Linares back and down. He made it to his feet but could not straighten up and the referee stopped the fight. The 30-year-ol Lomachenko adds the WBA lightweight title to his collection and scores his eighth win in a row by KO/TKO. A remarkable record for a remarkable fighter who has to be the No 1 pound-for-pound fighter today. It is a sign of the quality of Linares that the 32-year-old Venezuelan was neck-and –neck with Lomachenko before that body punch that finished the fight. Not bad for a guy who was being written off in 2012 after being floored and stopped by Sergio Thompson. He rebounded from that set-back with thirteen wins in a row, collecting two world titles and going 7-0 in world title fights. He deserves a return and it could be another classic. Adames gets his first win under the Top Rank banner with unanimous verdict over Barrera. The Dominican established a lead with a good first round. Barrera scored well early in the second before being rocked by a hard right and a left hook from Adames late in the round. The third was a fairly even round with Barrera working away to the body and Adames landing powerful rights. Adames scored with some eye-catching shots in the fourth but Barrera fired back as they traded just before the bell. The fifth again saw Adames landing heavy rights in a dominant round but Barrera did better in the sixth when Adames needlessly switch to southpaw, Adames pressed hard in the seventh pounding away to the head and body of Barrera who scored with a thudding left as the round ended. The eighth saw Barrera doing the pressing. But he lacked the power to really trouble Adames. Barrera also had a good ninth until a clash of heads opened a cut by Barrera’s right eye. Adames ended the stronger dominating the last as he looked for a knockout win. Scores 98-92, 97-93 and 96-94 for Adames. The 24-year-old Dominican already has wins over useful opposition in Ivan Alvarez, Jean Carlos Prada and former IBF champion Carlos Molina. As an amateur he was Dominican and Pan American Youth champion and collected gold medals at a number of major tournaments. Mexican Barrera was 25-1 in his first 26 fights but is now 4-4 in his last eight including a loss to Errol Spence but he also scored a good win over 20-2 Eddie Gomez. Lopez gets this one over in 64 seconds. After some early sparring as Freitas lunged in Lopez landed a pulverising right that sent Freitas crashing to the canvas and the fight was stopped immediately. Seventh win by KO/TKO for the Brooklyn-born 20-year-old Olympian. He is a former National Golden Gloves champion who competed in Rio but did not medal. He actually won the US Olympic Trials but because the spots at his weight had already been allocated he had to fight under the banner of his parents country of Honduras and he qualified by finish runner-up in one of the Americas qualifies. Brazilian Freitas falls to his second first round loss in his last three fights. Conlan outscores Spaniard Larringa. Conlan was dictating the fight from the bell. His quick, clever movement and fast hands had Larringa on the back foot as Conlan tracked him down and landed some speedy combinations. Larringa showed some nice defensive work in the second but Conlan was the one doing the scoring with a series of hooks to the body, A right to the head staggered Larringa at the start of the third but the Spaniard stood and traded punches for a short spell before some rib rattlers from Conlan had him backing off. Conlan landed a couple of rights to the head in the fourth that had Larringa holding on desperately and Conlan threw him off and down to the floor. Larringa was up and moving again and frustrating Conlan’s attempts to pin him down. Conlan was landing left hooks to the body and rights to the head in the fifth with Larringa just trying to survive. Conlan pressed hard over the last three rounds but the fleet-footed Larringa managed to avoid any serious trouble and was there at the bell in what had been a frustrating fight for Conlan. Scores 80-72 from all three judges for Conlan. It is still early days for the 26-year-old from Belfast and going eight rounds for the first time is all part of the learning curve. Larringa, a former WBC Mediterranean champion, had been stopped in two rounds by fellow Spaniard Artiz Pardal so did better than expected by extending Conlan. Uzbek southpaw Gaibnazarov halts Mexican Silveira in four rounds. Gaibnazarov landed some hefty lefts over the first two rounds but despite being cut Silveira hung in there and had a good third. Gaibnazarov floored Silveria in the fourth and then ended things with a left hook putting Silveira on the floor with the referee stopping the fight on the second knockdown. Second victory by KO/TKO for the 26-year-old Rio gold medal winner. First loss by KO/TKO for Silveria. Herring stops Sanchez but has to survive a physician’s inspection on the way. After taking the first round a clash of heads in the second saw southpaw Herring emerge with a cut by his right eye A collision of heads early in the third worsened the cut and the referee had the ringside physician inspect the injury. Herring was allowed to continue and he upped the pace trying to get the fight over before the cut caused a stoppage. He bombarded Sanchez with punches over the fourth round and was landing heavily in the fifth and with Sanchez not punching back the fight was stopped. The 32-year-old Herring turned pro in 2012 after failing to medal at the London Olympics. He won his first 15 fights before being stopped by Denis Shafikov in 2016. He recovered from that with a win over Art Hovhannisyan but then lost to Ladarius Miller in August. He has now signed with Top Rank and this was his first fight for them. Sanchez had lost on points to Teo Lopez in February and this is his ninth loss by KO/TKO.